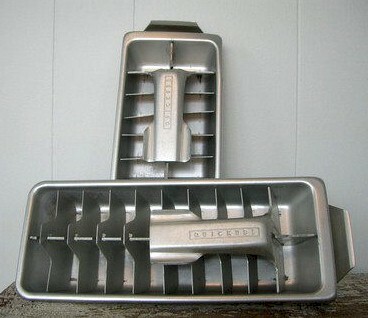 I now own two vintage ice trays like these. They're great and I've learned the secret is to take them out of the freezer and let them sit for about ten minutes. It makes releasing the cubes a breeze. Remember the ice-shattering sound the metal tray made when you yanked that handle? Ours were made by Mirro and lasted for decades. I still have my mother's from one of our old fridges as a child. I used it up until I got an icemaker in the freezer. This one was a double tray. Lots of cubes. We had this same kind, too. I wish they still made them because most of the plastic ones today are just junk. No, I don't have an ice-maker in my fridge. I've always thought ice cubes from an ice-maker taste a little off. My father would repeatedly break off the lever in frustration with his big mitts. You could get mild frostbite trying to free the cubes. I still have one. It's a double wide one, makes twice as many cubes. I use it too as an extra ice tray in my 2 year old stainless steel Frigidaire. BTW, to avoid the cubes shattering into pieces you simply run some water, from the faucet, over the tray for about 30 seconds before pulling the handle. No more problem. Almost every time you yanked the handle up, the cubes shattered into pieces. Oh Yes!! I remember those! I even had them when I first moved to my own place in early 80's! Those things hurt your hand trying to pull them up and I always had to run it under water to "loosen" it! Yep, I remember these well!